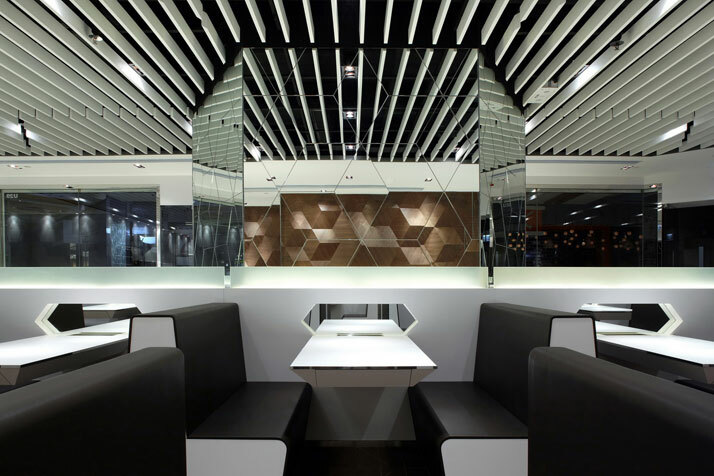 Fast food restaurant design was no challenge for Hong Kong-based designer Danny Chan, the former chief interior designer of Steve Leung Designers Ltd., and John Chan Design Ltd. Danny Chan has contributed to the trendy and fashionable re-branding of Maxim's Fast Food and designed many outlets in the Fairwood franchise; today, Chan is the director to his own entrepreneurial quest, Beige Design. 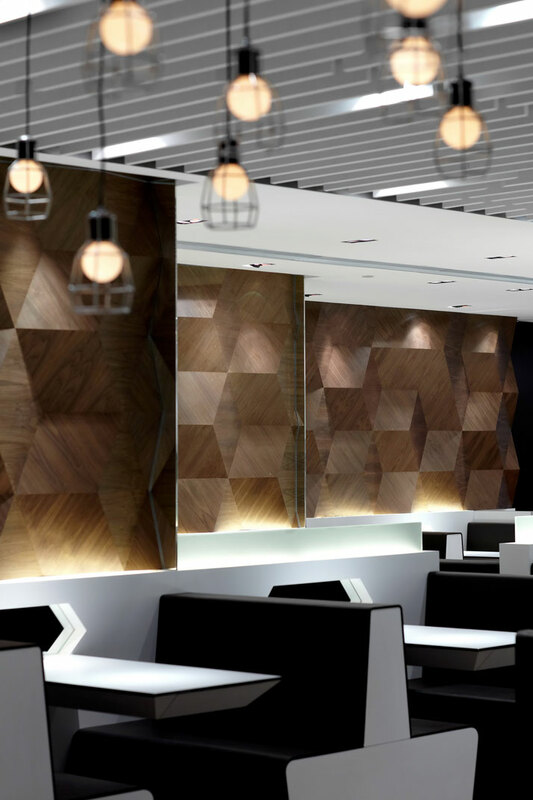 Commissioned to design a branch of the Fairwood Buddies Café in the Citygate mall in Tong Chong, conveniently located at the end of the ‘fast track’, the fast food restaurant takes a refreshing scoop of design and an interesting approach where the space is filled up with geometric hexagonal shapes! Beige Design was inspired and approached the interior, drawn by an oversized hexagonal column in the floor plan; the flimsy yet elegant design sparked off with a geometric recurrence within the space like a hexagonal chemical bond which is formed in chemistry. 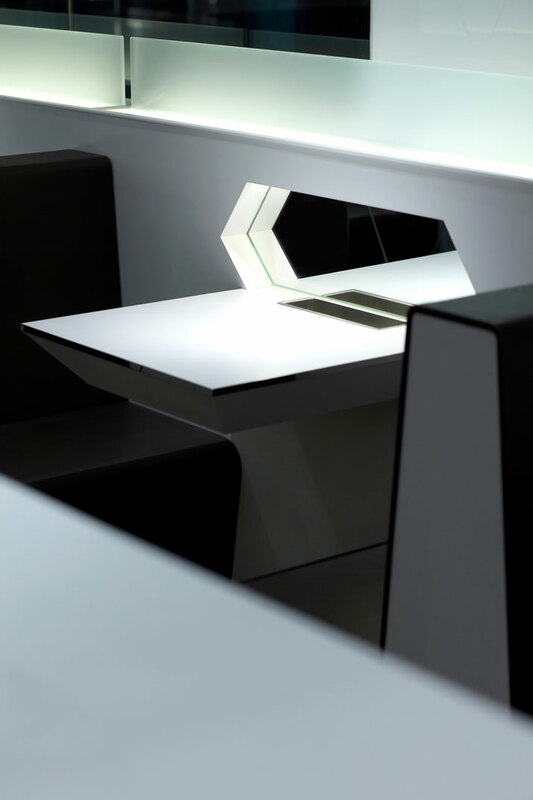 Taking a two-dimensional concept, the geometric form develops it into a three-dimensional interior architectural perspective with innovations and explorations; in a space totaling 180 square meters and without any view, this interior design approach defines the ultimate coherence possibility. 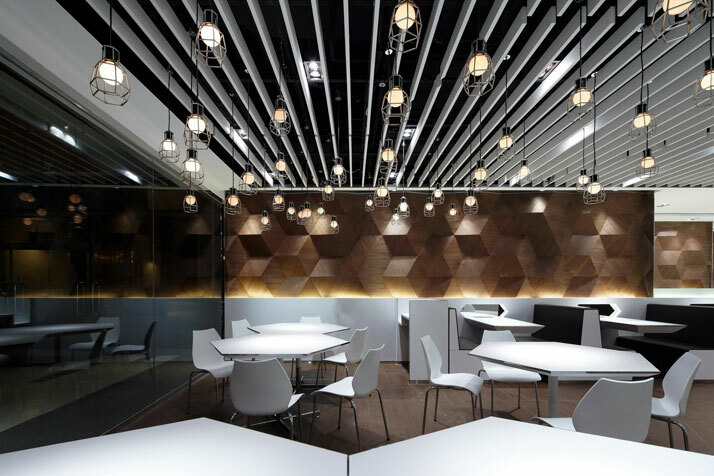 The hexagons bring about a coherent bonding portraying the ideal match between the central theme of the space – ‘buddies.’ The concept was that the hexagonal shapes take the shape of the space throughout. The original oversized hexagonal column is covered with mirrors to multiply the effect of the figure; this conveniently allows the oversized column to disappear into the space. 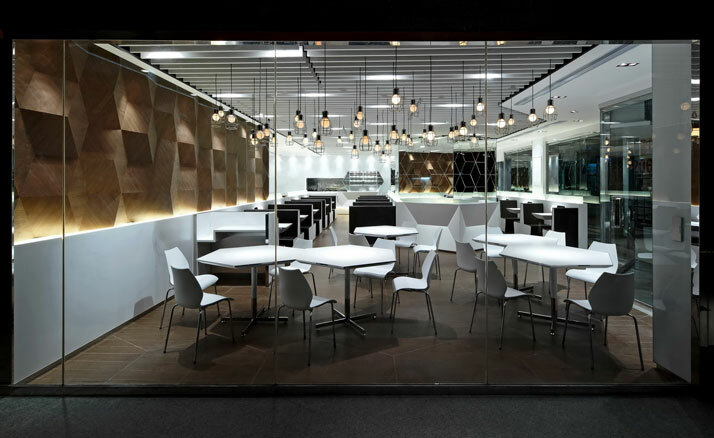 A Corian® hexagonal counter stands in front of the column; custom-designed pendant lights feature bare bulbs encased in hexagonal wire casing. The guests have the opportunity to peek through an attractive window into the cafeteria-style kitchen's roast meat area as there is a mirrored cutout at all the booths. 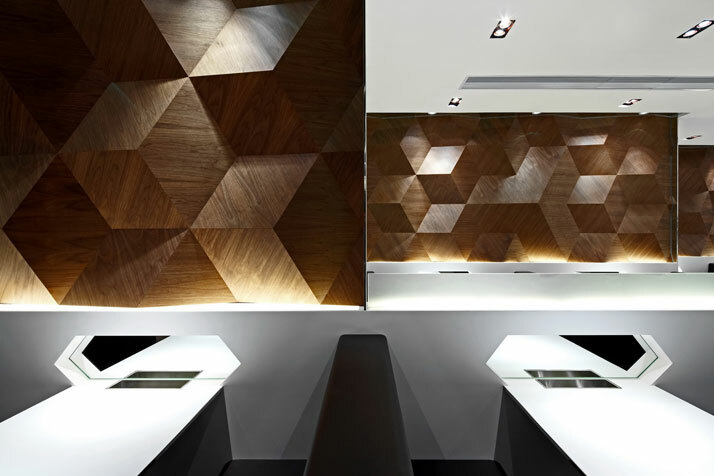 The spotlights divulge hundreds of the shape hidden in the three-layer staggered walnut veneer wall panels. 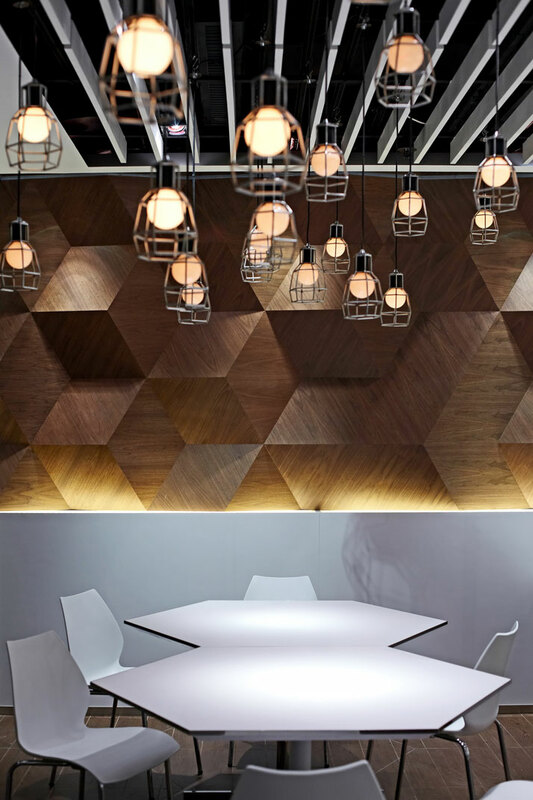 The flexible arrangement with the tables, allows the ‘feature’ hexagonal tabletops, to be pushed together and form a honeycomb shape to accommodate larger groups turning out to a pattern and the theme – for flexible ‘buddy’ socializing! Carefully arranged flooring, and custom-made furniture and fixtures add to the overall design scheme. 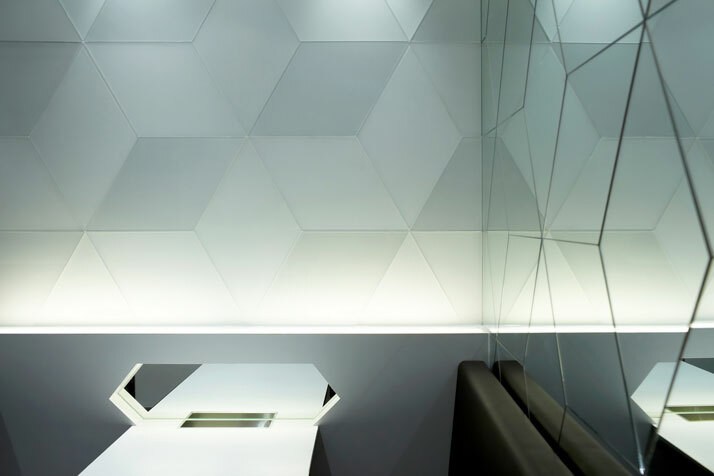 Subtle lines divide the ceiling blocks for once more into hexagonal zones. 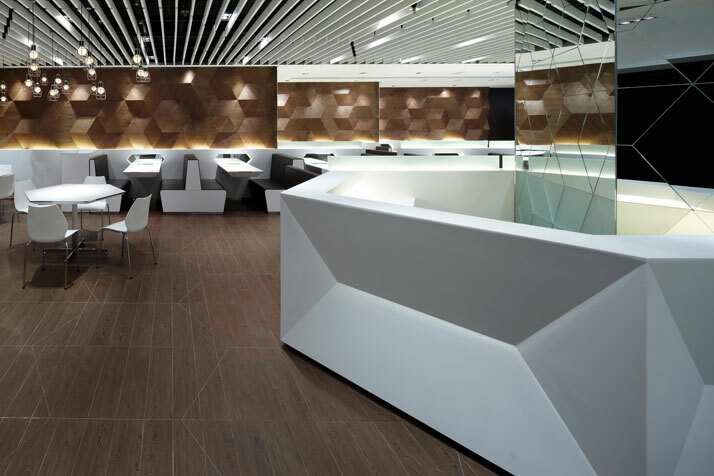 In a harmonious tone, the walnut color is offset by the pure white to form a clean and natural backdrop to stage the customers. However, Chan has decided to keep everything mostly white and stay away from the Fairwood corporate identity color – orange, which dominates the other cafés. The truth is that it is difficult to draw away from the identity color, as this may affect the company. However, this dedicated design approach shows the ultimate fragility a design can offer; the influence of this design language system can be revealed from the point where it starts. 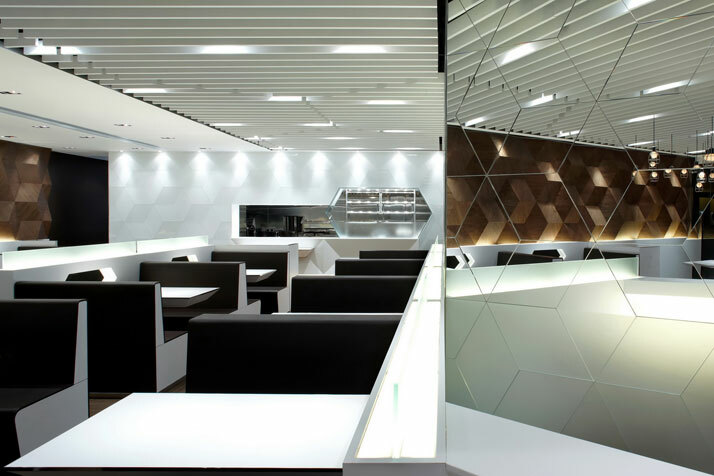 With its own design language, this fast food restaurant reveals the possible ultimate intimacy in an interior architectural design.